The Chairman of the Standing Committee of the National People's Congress is the presiding officer of the Standing Committee of the National People's Congress of the People's Republic of China, which is considered China's top legislative body. 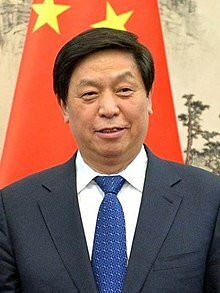 The current Chairman is Li Zhanshu. From 1998 to 2013, the position has been ranked second in China's political hierarchy since Li Peng was barred from seeking a third term as Premier in 1998. In the political order of precedence, the Chair ranks below the CPC General Secretary and President. From 2013 onwards, the Chair, Zhang Dejiang, ranked below the Premier, Li Keqiang. The ranking of this position is not necessarily reflective of its actual power, which varies depending on the officeholder. The position holds reserve constitutional powers under the 1982 revision of the Constitution of the People's Republic of China. As stipulated in Article 84 of the Constitution, should both the President and Vice-President become incapacitated, and the National People's Congress is unable to elect a timely replacement, the Chairman of the NPC will act as President. From 1975 to 1983, the NPC chairman was China's head of state, as the post of President of China was abolished. Theoretically, during the Tiananmen Square Protests of 1989, the NPC Chair at the time, Wan Li, had the power to call an emergency session of the NPC to resolve the issue constitutionally. However, Wan's freedom of movement was restricted, and ultimately was powerless in the situation.